Earn Money From Our Sales! Join the free MadBeeTech Affiliate Program and start earning easy money now! After joining the affiliate program, choose one of our links to add to your existing website. When a visitor comes to our site through your link, a cookie containing your affiliate information is saved on the visitor's computer. If the visitor becomes a MadBeeTech customer, our system retrieves the cookie and credits your affiliate account with a commission — even if the visitor doesn't become our customer until making a return visit to our site weeks later! 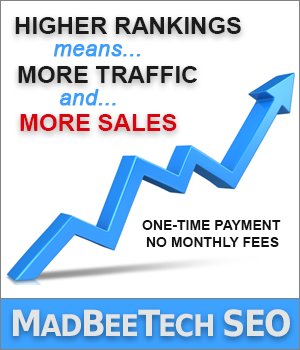 If you drive a visitor to our site, and that visitor signs up for a MadBeeTech website, you collect a commission. It's that easy! Why Become a MadBeeTech Affiliate? You don't need to have a MadBeeTech website — any website you already have works. Choose from a large variety of our graphic banners — add as few or as many banners to any number of your website's pages (or include a banner in your newsletter, if you have one). 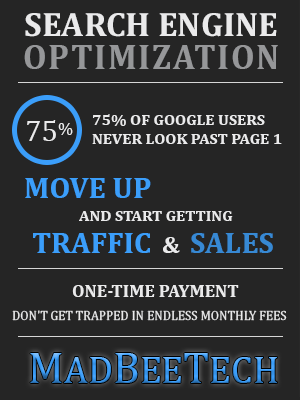 24/7 access to your private, detailed stats page that tracks clicks and sales you've generated. 90 day cookie means if a person clicks on your site's ad, that person can take up to 90 days to make a purchase at MadBeeTech and you still get credit (and commission) for that sale. Get paid monthly, regardless of how small or large your monthly commission sales are. Your payments will be paid directly to your PayPal account! 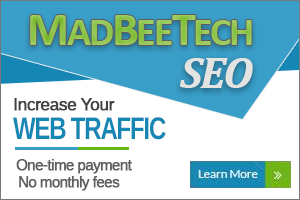 MadBeeTech's competitively prieced, full-featured search engine optimization (SEO) packages mean plenty of interest and plenty of potential commissions — up to $180 per referral! Click the Sign Up Now button and enter basic information about yourself and website. Upon sign up you immediately get a username and password to access your private referral stats page. Copy a short banner ad code snippet and paste it on your site to add an image ad to your site. When anyone clicks on the ad that person will be taken to the MadBeeTech website. If that person becomes a MadBeeTech customer, you earn a commission from the sale.